With large enterprises deploying Azure Site Recovery (ASR) as their trusted Disaster Recovery solution to protect hundreds of virtual machines to Microsoft Azure, proper deployment planning before production rollout is critical. Today, we are excited to announce the Public Preview of the Azure Site Recovery Deployment Planner. This tool that helps enterprise customers to understand their on-premises networking requirements, Microsoft Azure compute and storage requirements for successful ASR replication, and test failover or failover of their applications. 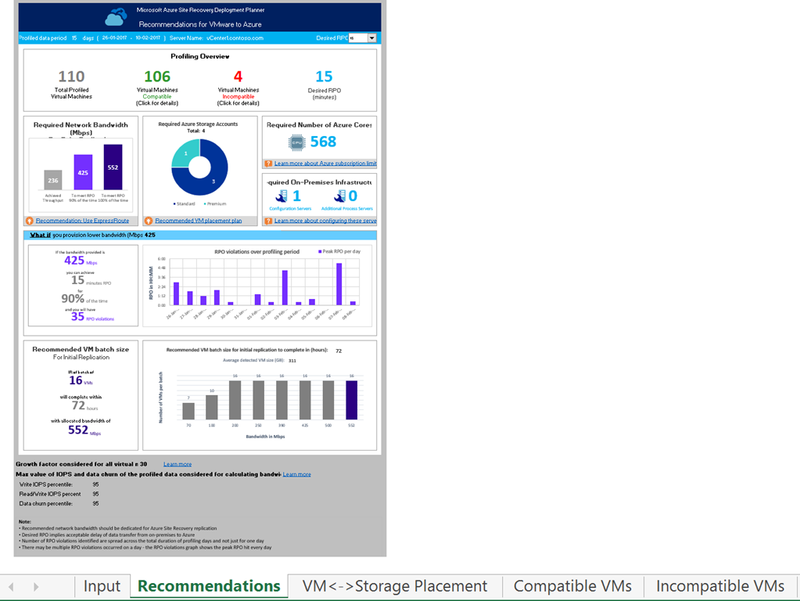 In the current public preview the tool is available only for the VMware to Azure scenario. The Deployment Planner can be run without having to install any ASR components in your on-premises environment. The tool does not impact the performance of the production servers, as no direct connection is made to them. All performance data is collected from the VMware vCenter Server/VMware vSphere ESXi Server which hosts the production virtual machines. What all aspects does the ASR Deployment Planner cover? Which on-premises servers are not qualified to protect to Azure with ASR and why? How much network bandwidth is required to replicate the servers to meet the desired RPO? How many virtual machines can be replicated to Azure in parallel to complete initial replication in a given time with available bandwidth? What is the throughput that ASR will achieve on my provisioned network? What RPO can be achieved for available bandwidth? What is the impact on the desired RPO if lower bandwidth is provisioned? How many storage accounts need to be provisioned in Microsoft Azure? What type of Azure Storage (standard/premium) accounts should every protected virtual machine be placed on for best application performance? What virtual machines can be replicated to a single storage account? How many cores are required to be provisioned in the Microsoft Azure subscription for successful test failover/failover? What Microsoft Azure virtual machine size should be used for each of the on-premises servers to get optimal application performance during a test failover/failover? How many on-premises ASR Configuration Servers and Process Servers are needed? How are all the above factors impacted after considering possible future growth of the on-premises workloads with increased usage? How does the ASR Deployment Planner work? In this mode, you profile all the on-premises servers that you want to protect over a few days, e.g. 30 days. The tool stores various performance counters like R/W IOPS, Write IOPS, data churn, and other virtual machine characteristics like number of cores, number/size of disks, number of NICs, etc. by connecting to the VMware vCenter Server/VMware vSphere ESXi Server where the virtual machines are hosted. Learn more about profiling. By default, the tool takes 95th percentile of all the profiled performance metrics and includes a growth factor of 30%. Both these parameters, percentile calculation and growth factor, are configurable. Learn more about report generation. In this mode, the tool finds the network throughput that can be achieved from your on-premises environment to Microsoft Azure for ASR replication. This will help you determine what additional bandwidth you need to provision for ASR replication. Learn more about throughput calculation. With ASR’s promise of full application recovery on Microsoft Azure, thorough deployment planning is critical for both disaster recovery and migration scenarios where ASR is used. With the new ASR Deployment Planner, we will ensure that both brand new deployments and existing deployments where you are looking to protect or migrate more servers get the best ASR replication experience and application performance when running on Microsoft Azure. You can check out additional product information and start replicating your workloads to Microsoft Azure using Azure Site Recovery today. You can use the powerful replication capabilities of Site Recovery for 31 days at no charge for every new physical server or virtual machine that you replicate. Visit the Azure Site Recovery forum on MSDN for additional information and to engage with other customers, or use the ASR UserVoice to let us know what features you want us to enable next.